DoubleD Athlete: Getting Faster? 2 PRs? 8 min miles?! Getting Faster? 2 PRs? 8 min miles?! It seems like every season my times just seem to get faster- I can't complain- REALLY! So on March 10th we did the Celtic 5k which is always a fun race. It is less than a mile from my house. Some co-workers even joined us this year. I had done my computrainer class on Saturday and rode 45 mi of the Italian Alps so I had little to no expectation. My legs still were sore. But I love that course and its my 5k test route so I know it well. I started and decided I'd give it a shot. And it turned out pretty good 26:24! New 5k PR by 30 seconds and took a minute off my time here last year! Can't fight with that result. Getting even closer to that goal for this year of a 25 something. I need to learn a little more about pushing those limits. This past Sunday with a last minute decision we got in the car and decided to head to a 5 Miler. I hadn't done a 5 Mile race since 2011. 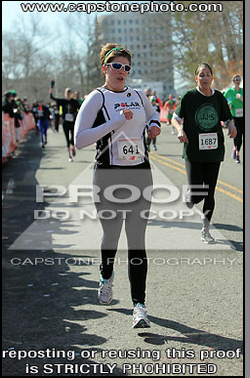 I had every intention of this race being a part of my training plan for the day. D and I did a little pre run of about a mile. I was deathly afraid I would be in DFL. There were like 75 people there. I think at run races EVERYONE will be faster than me. The gun went off and the first mile went fast. It was 8:20. OOOPS! Okay slow down- get into a better pace for the next mile and a half. I want to negative split this. So at 2.5 I looked down at my watch 23. Okay that looks good. I had thought I would run it at about a 46 so with a negative split even a slight bit I'll beat that's good. Well I then made a deal with myself no pace should read 9 anything for the next 2.5 miles. So I dug in, started to chase down the people in front of me, one lady down, another girl who was sweet and chatty but I had business, then passed another girl she wanted to quit I told her I had been chasing her. I passed a guy and then ... no mans land. Okay lets see I can barely see that yellow shirt lets go.... Well I ran out of race before I could catch the yellow shirt. But I came in at 44:00. The 5 Miler I did in 2011 was 54. Okay so 10 min off. NICE! I was pretty proud of myself. And yes I did negative split- 23 then 21. So much for that zone 2-3 training run! 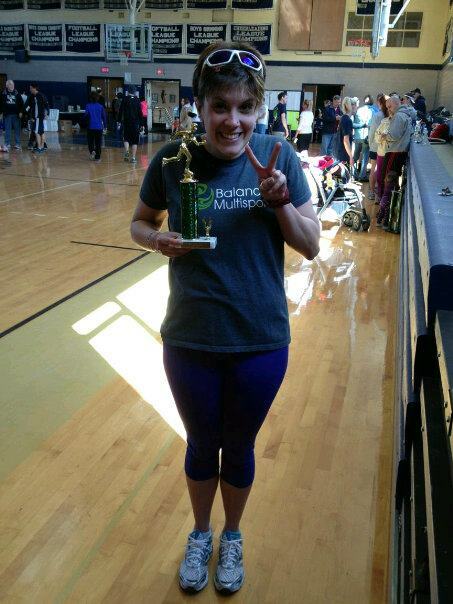 I came in 50th overall and much to my surprise even took home 2nd in the female open division. I can't believe I ran a 8:48 paced 5 Miler. I think it is time I start learning a bit more about what these legs are capable of! D even took 3rd in his division with a 3min PR! It was a great day for both of us after a last minute decision to run! :) and i am SO excited for your marathon!! "If you have to ask you just won't understand"